Onwards and into the Meg. Let's start with the new thrills, shall we, and kick off with the most welcome return of Young Middenface. I stated in my Meg 207 review I wanted more, and I guess others at the time did too! We see the young Scottish mutie on the run from some 'norms' with his buddy Scaly when they find sanctuary in a small village of Brigadoom. But are the inhabitants every thing they seem on the surface? My opinion of this strip has not altered, I still like it. Alan Grant is still writing it, but art duties have passed to Patrick Goddard on pencils and Frazer Irving on inks. I like both artists, and the result is more than pleasing. Looking forward to the next episode of this! Next up let's talk about Mean Machine in Angel Heart. Everyone's favourite 'nut' job (I thank you) is locked in an iso cube when he is befriended by the sweet Porsha Wuss. Will Mean Machine give up his evil ways and become a reformed character for the love of a good woman? John Wagner is scripting this one, and I hope it doesn't drag on as it has the potential to be a good, punchy story. It was a good set up this edition. I think it has the potential to go a bit silly, but hey, let's see what happens. I'm now starting to understand that some of the creators like to play the 'silly card' with their characters every now and then. Now I've figured that out, I'm not so against it. In a response to a Dreddlines letter, (Arch Duke) Barnes says he likes to have a blend of strips in the Meg - from things that are a bit silly to quite gory and hard hitting (like the Judge Anderson story we had recently). I whole-heartedly support that view now I realise this is intentional, rather than just bad writing... Anyway, I've digressed slightly - the Millgate art droid functions most adequately. It's quite cartoon-y, but that is in-keeping with the story. And after a number of one-off stories, Dredd is off on an adventure to the the Cursed Earth with Chief Dourney of the Ranger Unit in the new story Damned Ranger. This is another John Wagner story (are we spoilt with all these wonderful writers, or what?!) with John Ridgeway provided lovely art. Again, a good set up and I am itching to dive into the next episode. In the reprints, Charley's War continued with me starting to hate every bone in Lieutenant Snell's body. A testament to Mills and Colquhoun about how much I care about these characters. Hell Trekkers is set in 2106 AD and follows 110-odd people leaving Mega City One to seek a better life in the New Territories. In these first 6 episodes all sorts get thrown at the group - and I am finding it doubtful any of them will make it! Good story, though. Again, it's old school 2000 AD aimed at children / teens but that doesn't worry me. I quite enjoy these strips. It's Wagner and Grant again, this time under the name F Martin Candor and Ortiz is on art duty. I haven't seen much of his work before, but his style fits well with the subject matter. Boy can that man draw a dinosaur! I asked in my Meg 215 whether the Metro Dredds that were being introduced were any good? Well, we got a reprint on one in this Meg Mutie Menace. Difficult to see how it worked over 5 newpapers, but as a one page strip I enjoyed it a lot. I wonder if the Meg will reprint any more? 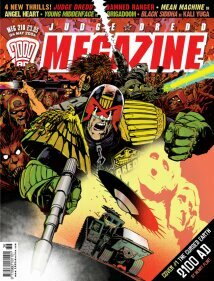 On the text article front, The Dredd Files perked up a little with the Cursed Earth saga being covered. The emphasis is on 'little' as I skimmed it in about 2 minutes. Gordon Rennie weighed in on the use of illicit substances by comic creators to aid their inspiration in his regular You're Next, Punk column. Good fun as always. And finally...Tharg decided to advertise his latest wares - mobile phone wallpapers, operator logos and picture messages. That brought back a few memories, when such things were premium items commanding a few quid for each download. My old Nokia 6310i was listed as compatible - good news!